I can’t wait one more second to see the Floating City in real life. Rushing past my mom, I push open the glass door of the train station. The pavement and roof make a frame outside the terminal, surrounding a beautiful panoramic shot of Venice. It’s like I’ve stepped right into a painting. People are everywhere. They’re sitting and standing and pulling suitcases. They’re taking photos and selfies and talking on cell phones. They’re speaking in a million different languages. I run down the steps and don’t stop until I reach the Grand Canal. Mom finally catches up. We stand still, not saying a thing. I have no words for what’s in front of me. There’s a stone building with a big green dome taking over the scenery and a big bridge to my left that crosses over the canal. I wonder what’s on the other side, behind all the buildings. Boats of different sizes go by one after another, leaving small waves behind them. I’ve spent six incredible days touring Italy with my mom before she starts her new job. And now for the rest of August, we’ll be living across the lagoon from Venice while she works. Mom wanted to stay at our new apartment on the mainland and then swing by the office, but not me. No way. I convinced her to take the quick train ride into Venice for some sightseeing first. I’ve been waiting my whole life to experience this place. “Can’t you start work tomorrow?” I ask. I don’t mean it, of course. Six days is already way more than Mom has ever taken off work. I’m not surprised she’s dangling this amazing city in front of me only to get started working. I guess I shouldn’t expect things to be different right off the bat. Mom looks at her phone again, but when I give her my puppy dog eyes, she slips it back in her purse. The first step on the bridge is magical, like I’m entering a new world. Not quite the wardrobe to Narnia or the train to Hogwarts, but close. Seriously close. 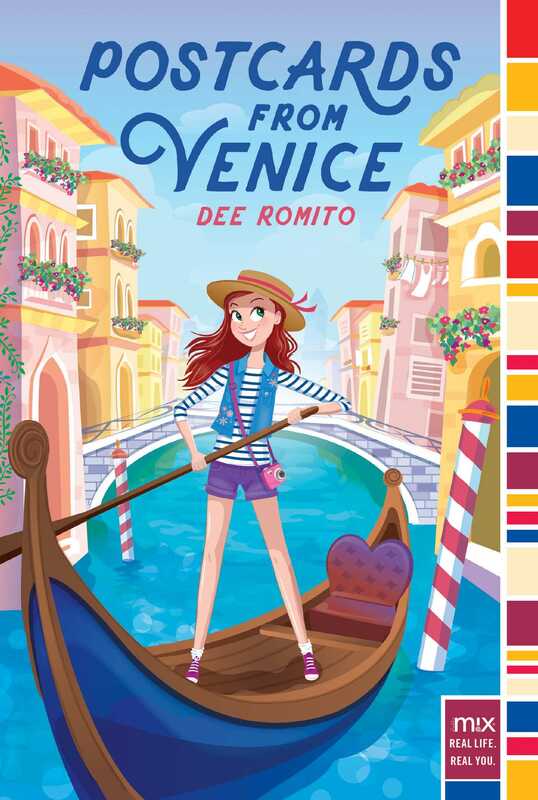 I’ve dreamed of going to Venice since I was a little girl. And here I am, standing in the middle of a bridge, looking out over the Grand Canal. Officially in Venice. Mom and I stand here, taking it all in. I’d have to say that my favorite thing so far had been watching the sunset from Piazzale Michelangelo in Florence. You can see the whole city from up there. But this place instantly takes over the number one spot. “So, what are the chances we’ll actually stay for the year?” It’s the same question I’ve asked every day since we got here. The more I see of Italy, the more I don’t want to leave it. It won’t be all fun and gelato, though, since she insists I be productive and “learn a little something” while we’re here. I’m distracted from the conversation when a beautiful gondola appears from under the bridge. Mom laughs. When her phone goes off with a text notification and she doesn’t grab for it, I wonder if she’s actually stopping to enjoy the moment. And I thought this day couldn’t possibly get any better. I grab Mom’s hand and pull her across the bridge.